IlluminIT gives the enterprise an immediate value, adding automation in various solution areas. The IlluminIT Business Service Mapping platform is a key solution for many business requirements. By creating an up-to-date map of applications and IT infrastructure, IlluminIT provides the information you need to align IT with business. IlluminIT automatically discovers and maps how each business service flows and utilizes the IT infrastructure allowing you to manage IT from a business perspective. IlluminIT enables enterprises to improve their business continuity and availability by aligning the Production Environment toDisaster Recovery, and by resolving issues before business disruption occurs. IlluminIT allows the enterprise to “sandbox”, and to simulate changes in order to see their immediate impact on all related business services, before deploying. Experienced Consultant with a demonstrated history of working in the information technology and services industry. Skilled in Business Process, Analytical Skills, BMC Remedy, IT Service Management, and Java. Strong consulting professional with a MSc focused in Information Systems and Computer Engineering from Instituto Superior Técnico. ITSM Solutions Architect with 20 years of experience in IT Service Management, 17 of which working in projects related to BMC ITSM. Carlos has extensive experience as Technical Lead in BMC ITSM implementations end to end and advisory/mentoring roles. 10 years of experience in working exclusively in international projects. Focussed in adding value, while delivering objective and consistent results to meeti customer needs. One day. unlimited possibilities for your career and your company. There's never been a more exciting time to be in IT. 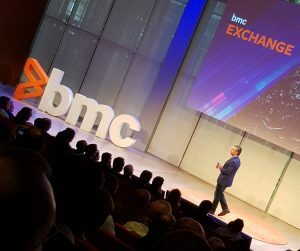 When you attend BMC Exchange, you'll get insights and best practices to maximize your IT investments while advancing your career path and your professional connections. Join us in Madrid 23rd October and London 30th October 2018 for BMC Exchange. Tiberone was formed at the start of 2001 and focuses on the design, delivery and support of IT Service Management Solutions from BMC Software, Inc.
2018 © Tiberone All Rights Reserved.